Sailing the islands of Croatia is fast becoming as critical as seeing the Eiffel Tower. From the clubs of Dubrovnik Old Town to the postcard town of Split with so many white beaches and ocean time in between. This trip even goes reverse if you'd rather start from Split. Wild Bay, anyone? The sun is shining, the sea is glistening & 8-days of Croatian goodness sit ahead of us. Settle into our shiny sail boat & use any remaining daylight to explore the UNESCO World Heritage site of Dubrovnik. Tonight we'll slip into holiday mode with a dinner onboard our boat. Rise and shine, we're raising anchor! Take in the beauty of Dubrovnik one last time. We've no doubt got a bunch of new friends on hand already, and it's time to set sail. 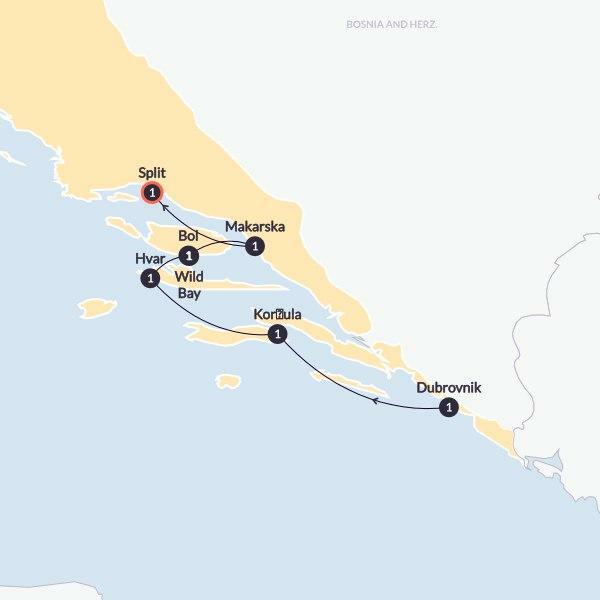 Don't fret, there will be plenty of swim stops as we make our way to our next destination.Cruising the good-looking Dalmatian coastline we make our way to Korčula, home of the legendary explorer Marco Polo. On arrival we'll enjoy lunch onboard, fuelling us for a day exploring the Venetian architecture & pretty buildings of this walled fishing village. Our Trip Manager will take us on a tour of the town with info on the incredible paving and landscapes and its relationship with the natural environment. Tonight, you'll no doubt be ready for a night out and we recommend heading up one of the city's tower wall bars for a cocktail while watching the sunset. This morning we wave goodbye to Korcula, sailing into a fresh day of sunshine in search of our next island.A celeb hang out, a museum of super-yachts, a nightclub hub - Hvar is nothing short of wonderful. We will take an orientation of the town where we will get you in the know on the Arsenal (known as the most beautiful building in the whole of Dalmatia) and the Venetian Fortress which represented the strong naval history of this cute town. Whether you spend the day exploring, catching rays beachside or sipping cocktails at Hula Hula Beach Bar, you won't be disappointed. This is the ultimate. Relax and recap on the evening over a late breakfast before we drift off to the next destination calling our name. Out of the city vibes we truly set sail today, for some serious island vibes.The sound of 'Wild' Bay might scare you after what may have been a night of debauchery. But rest assured Wild Bay is exactly what you need - turquoise waters & tranquil vibes aplenty. So long oasis of dreams, we have another stunning port to throw down anchor at. Ahoy! We will be stopping for plenty of swim stops and throwing the anchor down, sounds good to us sailor types.Little bays of pebbles & a quaint seaside town wait for us in the south of the island of Brac. Get a bit cultural today with a visit to the King’s stairs and the Dominican Monastery. Later we can choose to loosen up over our Captain's dinner and pirate party. Another easy like Sunday morning start to our day is in order after the pirate party. Lounge around enjoying breakfast and sunshine as we depart Bol and head for Makarska, and yes, more swim stops await today.The afternoon is yours to run off and explore from our docking at the base of a massive cliff face. Long white-pebbled beaches, fruit and flower markets & restaurants overflowing with fresh seafood - pure Croatian bliss. Today we make our way out of Makarska - a fun-filled finale in Split coming right up!Soak up the Roman heritage of the 220 buildings and sprawling cathedral that make up the Diocletian’s Palace before sitting by the Mediterranean to map out our last night on tour. Best go out with a bang! There you have it, the astonishing beauty of Croatia and its cluster of islands. You probably always imagined you'd be blown away by it, but the new squad of life-long pals will be the real surprise. Round Two: Turkey & Greek Island Odyssey? There'll be fun and frolics aplenty on board the traditional sailing boat, where for 7 nights you'll be tucked into cosy twin-share cabins. Sample squid-ink risotto, fresh platters of seafood and summery salads as we hop between islands. We'll be keeping you well fed with breakfast every day, 5 lunches and 2 scrumptious dinners.